A solid trio of classics (or at least two classics and one that deserves to be) arrived on Blu-ray last month, two from Criterion and one exclusive to the TCM Vault. 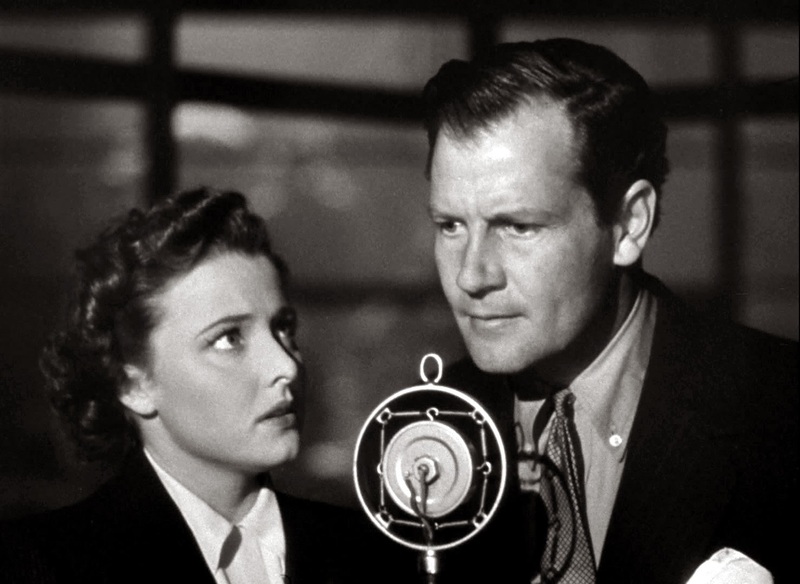 Alfred Hitchcock's Foreign Correspondent is a crackerjack spy thriller starring Joel McCrea as reporter Johnny Jones, a disinterested American who gets caught up in the intrigue surrounding the early days of England's entry into war with Nazi Germany. Criterion made a wonderful choice in adding this to their stable of classics, not just because this is a fine example of the World War II propaganda film, but also because this is a proto-action film, a forerunner of the type of blockbuster that rules the summer box office today. For some inexplicable reason probably having more to do with serial conventions of the time, Jones adopts the ridiculously alliterative pen name of Huntley Haverstock (which has the curious effect of having characters refer to him by Johnny or Huntley interchangeably throughout). 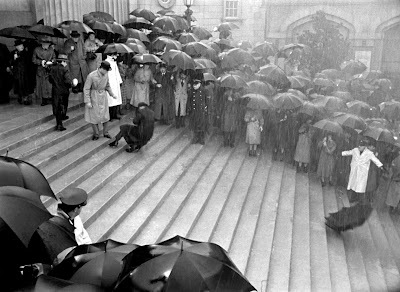 An ill timed, rain-soaked run-in with a pivotal ambassador on the steps outside a peace conference is the start of a powerful setpiece: the diplomat is shot (in the face!) and killed by a photographer hiding a gun next to his camera; the gunman runs into a crowd of umbrellas before running into a busy roundabout and hiding between the buses; Huntley gives chase, jumping on the the getaway car's running board before the assassin throws him off and Huntley rolls onto the street in a heap. It's all very exciting, doubly so because of the scene also introduces George Sanders. An appearance by Sanders, no matter how suave, usually telegraphs that he's up to no good simply because of the sheer number of villains he played. But here we get a dashing Saunders, every inch the hero Huntley is as Scott ffolliott (regarding the double-f: "How do you say it, like a stutter?" "No, it's just straight 'fuh! '"), his British counterpart. Saunders gets to knock heads with the evil spies, escaping by jumping out a window high above the streets and onto an awning that breaks his fall, another in a list of stunts (I won't ruin the finale's pièce de résistance) that will have you applauding the technically adept Hitchcock for pulling off such sequences so credibly decades before the modern visual effects age. All of the excitement generated is almost enough to make you forget how forcefully Foreign Correspondent advocates for America's entry into the war (it was made before the attack on Pearl Harbor when our government was dithering on whether to get involved). Almost, I say, because the film's ending, a speech by McCrea's Johnny/Huntley on British radio calling for his compatriots to join the effort is a conspicuous addendum to a movie that already wrapped up about five minutes earlier. If you're going to allow yourself to be manipulated by governmental peer pressure, though, I can think of no better picture than Foreign Correpondent to submit to. 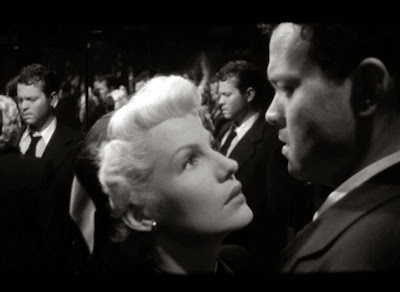 Now for post-war disillusionment, is there a wilder, more overtly surreal forties film noir than Orson Welles' The Lady from Shanghai? Sony Pictures has just released a beautiful Blu-ray exclusively through the TCM Vault Collection. What better way to display the contrast between the chiaroscuro shadows and Rita Hayworth's platinum-tressed femme fatale? As with all TCM Vault Collection exclusives, the The Lady from Shanghai comes chock full of extras like an introduction by TCM host Robert Osborne, loads of publicity and behind-the-scenes stills, plus Welles confidant Peter Bogdanovich's original commentary for the DVD version. Director Welles also stars in The Lady from Shanghai, his only film with his then-wife Hayworth. Its murder plot is circuitous enough that one gets quite lost quickly during the brief 90-minute running time. 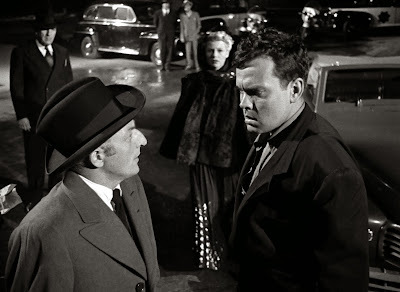 Welles acknowledges the story makes little sense in the bizarre, unrealistic way he frames character actors like Glenn Anders, Ted de Corsia and Everett Sloane (as Hayworth's rich, crippled husband), all enlarged in the foreground like some Jim Steranko comic book panel. 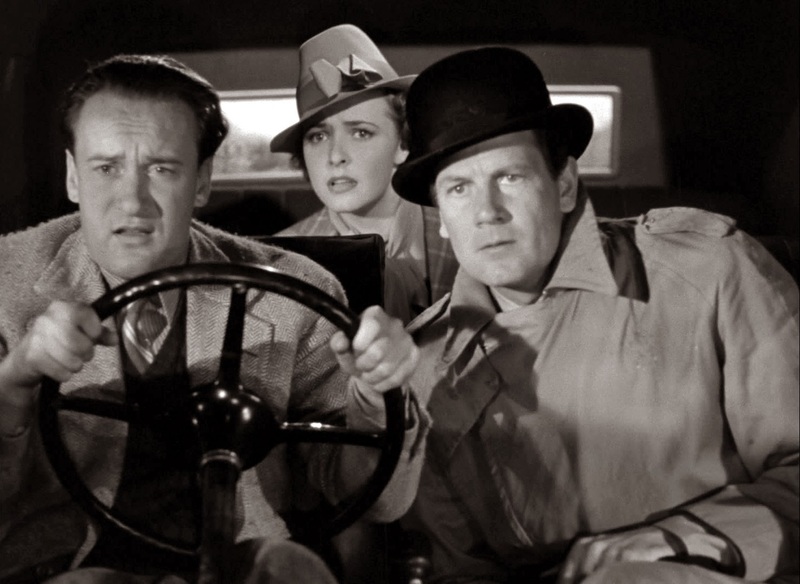 The warped mise en scène foreshadows the climactic confrontation between the three sides of the romantic triangle—Hayworth, Sloane and Wells—in an abandoned amusement park that grants the filmmaker license to throw any kind of logic out and go all Cocteau-funhouse on the finale. An observation: evocative location photography in San Francisco and its wharves probably served as a visual influence for the first act of Paul Thomas Anderson's The Master. Back to the Criterion Collection now, which often spotlights overlooked classics worth reconsidering. Roman Polanski's Tess is just one of those films, a personal project in that it fulfilled a promise to his late wife, Sharon Tate, who had always wanted him to adapt Thomas Hardy's Tess of the d'Urbervilles for the screen. Nastassja Kinski stars as the peasant girl, Tess, in one of her earliest performances. It is easy to see why the actress and her character are always the center of attention. Kinski is simply transfixing and her wounded expression seems to beg for protection. Polanski uses her stricken quality to tell the story of a woman who is victimized by her era's expectations for females, particularly those restricted from upward mobility. The Oscar-winning cinematography by the late Geoffrey Unsworth (who died during production) and Ghislain Cloquet serves to remind us of the beauty of nature that the nearly pagan Tess turns her back on in order to conform with the "civil"society that won't have her. Though, on the surface, among the most genteel of Polanski's films, Tess is among the most spiritually violent of his oeuvre if one really thinks about it. The story begins innocently enough, with Tess's father John asking the local minister why he always refers to him by the respectful title Sir when he is a common man and a poor one at that. Pastor Tringham explains that genealogical records show him to be related to the noble D'Urbervilles, now penniless and all but extinct. John Durbyfield soon sends his daughter out to the D'Urbervilles to reclaim her kinship. The chain of events that follows proves disastrous to the innocent Tess, who loses her chastiity, her baby and more as a result of Tringham's well-intentioned greeting to the elder Durbyfield. As the vicar tells someone late in the film, the Durbyfields "were an odd family. My colleague, Mr. Tringham, would have done better to keep his mouth shut." Once Tess meets her tragic fate you'll agree with the vicar. She goes from being blissfully ignorant about class to sacrificing more than anyone should just to try to fit into high society. Her lamentation near the end, "Why am I on the wrong side of this door?" is also a haunting surrender to her destiny.